Nihang is a Persian word meaning crocodile. 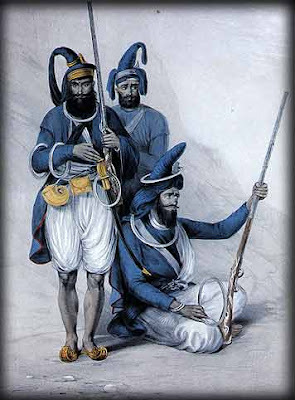 Nihangs were suicide squads of the Mughal army and wore blue uniforms. The Sikhs took the name and the uniform from theMughals. Nihangs constitute an order of Sikhs who, abandoning the fear of death, are ever ready for martyrdom and remain unsullied by worldly possessions. A Nihang is one who has nothing and is free from anxiety. The order is said to have been founded by Guru Gobind Singh himself as a fighting body of the Khalsa. The Nihangs were also called Akalis (servitors of the Timeless God) which term has now become synonymous with the members of a political party in Punjab. (Most of them wear blue turbans). 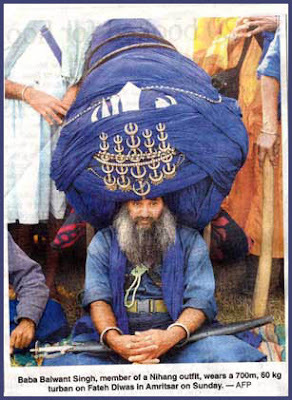 Nihangs can be recognized from a distance as they wear dark blue robes with their legs bare below the knees and high blue and yellow turbans laced with steel discs. They usually carry spears, swords, daggers and shields. They use a charming vocabulary of Braggadocio, which has found its way into the Punjabi language. The sect of the Akalis differs essentially from all other Sikh orders in being a militant organisation, corresponding to the Nagas or Gosains among the Hindus. Their foundation is ascribed to Guru Govind Singh himself, and they steadfastly opposed Banda's attempted innovations. The term 'Akali' is sometimes said to be derived from 'Akal-purusha' - 'worshipper of the Eternal.' But Akal means 'deathless', i.e. 'God', and Akali is simply 'God worshipper.' The Akali wear blue chequered dresses, and bangles or bracelets of steel round their wrists, and quoits of steel in their lofty conical blue turbans, together with miniature daggers, knives, and an iron chain. 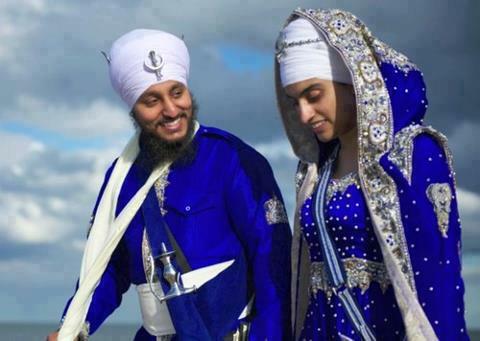 is the Sikh marriage ceremony, meaning "Blissful Union" or "Joyful Union", that was introduced by Guru Amar Das. fourth laav . . . There are four wedding rounds in the Sikh marriage ceremony. Its called Lavan (the marriage Hymns). Each of the four Laav has a special significance and describes the marriage of the soul-bride to the divine husband. The hymns outline the progressive stages of the awakening soul-bride as she advances spiritually to ultimately blend with the divine groom in the dawning realization of her divine destiny. The Lavan hymns are compositions of Guru Raam Das, and were written for the occasion of his own wedding to Bibi Bhani.